Platybelodon was a genus of herbivores (plant-eaters) related to elephants that lived in Africa, Asia, Europe and North America, during the Miocene epoch between about 15 million and 4 million years ago. 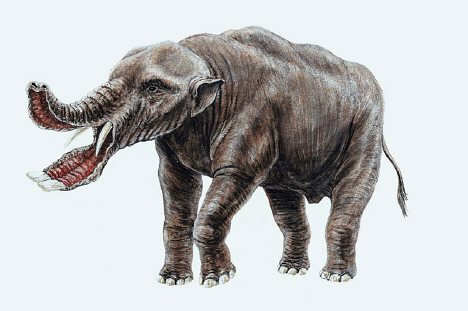 The name "Platybelodon" means "flat-tusk" and refers to it two lower which were greatly extended (it is from these teeth that the genus gets its popular name of "shovel tuskers"). A number of different theories have been proposed for how the animal may have used these teeth - they may have been used to shovel up vegetation when feeding in swampy areas, they could have been used to strip bark from tees, or they might have been used to dig for water.